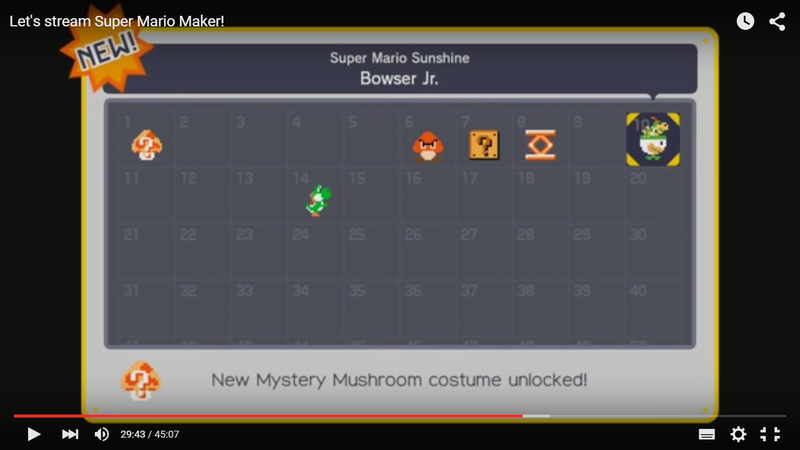 Mystery Mushroom Super Mario Maker Unlock the Mystery Mushroom course element Gives Mario a random costume that the player already unlocked. Use Mario amiibo from Super Smash Bros. series or Super Mario series A recolor of Mario's original Super Mario Bros. sprite that uses his modern colors. It has a new turning sprite that looks more accurate than the original one. Upon grabbing the Mystery Mushroom, the sound effect after exiting a pipe in Tiny-Huge Island and in the opening of Super Mario 64 can be heard. The "Course Clear" tune is replaced by the one heard after obtaining a Power Star in that game. Mario's jumping sound effects are also replaced by Super Mario World's. The death tune is the Game Over tune from Super Mario 64, and the invincibility tune is replaced with the Wing Mario/Vanish Mario tune from that same game. This costume is also used for Big Mario's modern appearance, except it can wear Shell Helmets and doesn't have any of the costume's unique sound effects. Use Peach amiibo from Super Smash Bros. series or Super Mario series Based on Peach's modern appearance as opposed to her original NES sprite from Super Mario Bros.. Upon touching the Mystery Mushroom, the mushroom pickup sound from Super Mario Bros. 2 will play. The jumping sound, death jingle, and "Course Clear" fanfare are also replaced by their Super Mario Bros. 2 equivalents. Peach also takes out her parasol when she jumps or when the player presses . Upon clearing the 10-Mario Challenge, or 100-Mario Challenge on Easy, in this suit, Toad will say, "Princess Peach?! How did you escape! ...Oh. It's just a costume." Use Luigi amiibo from Super Smash Bros. series or Super Mario series A recolor of his original NES sprite from Super Mario Bros. that uses his modern colors. Therefore, it has the same poses as his brother's. The "Course Clear" and "lose a life" tunes are replaced by the ones heard after obtaining a boss key and getting a Game Over from Luigi's Mansion, respectively. Upon getting the Mystery Mushroom, Luigi's voice can be heard shouting, "Yeah!" Goomba Super Mario Bros. Unlock the Mystery Mushroom course element Has a red coloration similar to that of a Red Paragoomba, possibly to differentiate it from the enemy Goombas. Pressing causes it to be squished.
? Block Super Mario Bros. Unlock the Mystery Mushroom course element Resembles a Coin Box. Mario's legs can be seen underneath it when moving. Pressing causes it to change color. Trampoline  Super Mario Bros. Unlock the Mystery Mushroom course element Based on its modern design opposed to its original NES sprite from Super Mario Bros.. The jump sound has changed to the sound when something bounces on a trampoline. Pressing and holding will turn the Trampoline into its original sprite from Super Mario Bros..
Use Toad amiibo from Super Mario series Based on Toad's modern design as opposed to his original NES sprite from Super Mario Bros., as well as the Pixel Toad from Captain Toad: Treasure Tracker. Toad will shout "Here I go!" upon touching the Mystery Mushroom. Upon reaching the end of a castle, the kidnapped Toad will say "Ah, Captain! It's terrible! Princess Peach has been taken to another castle!" to Mario wearing the Toad costume, in reference to Captain Toad. Use Bowser Jr. amiibo from Super Smash Bros. series Bowser Jr. himself has his palette based on Bowser's original sprite in Super Mario Bros. However, he appears in his Junior Clown Car, based on his appearance in Super Smash Bros. Bowser Jr's death and clear sounds are the same, but reuse voice clips from previous games. His running sound is the sound of the Koopa Clown Car moving, and his jump sound is his own jumping sound. His running animation is based on the Clown Kart Dash, his side special move in Super Smash Bros., and when swimming, a bubble encloses the Junior Clown Car. Use Mario - Silver Edition amiibo from Super Mario series A silver palette swap of Mario's modernized Super Mario Bros. sprite. The Gold Mario power-up sound effect from New Super Mario Bros. 2 can be heard when transforming into Silver Mario, and sparkling sound effects are heard while the transformation is active. The Super Star music is also changed to Metal Mario's theme from Super Mario 64. Use Mario - Gold Edition amiibo from Super Mario series A golden palette swap of Mario's modernized Super Mario Bros. sprite. The Gold Mario power-up sound effect from New Super Mario Bros. 2 can be heard when transforming into Gold Mario, and sparkling sound effects are heard while the transformation is active. The Super Star theme is also changed to Metal Mario's theme from Super Mario 64. Builder Mario Super Mario Maker Clear normal Gnat Attack for the first time An 8-bit rendition of the attire Mario wears on the boxart and promotional art. Upon transformation, the "Super Mario Maker!" shout from the title screen is heard. In addition, the normal Super Mario Bros. power-up sound is retained, the "course clear" tune is the start-up jingle from Super Mario Maker, and the "lose a life" sound is changed to the Game Over sound from Gnat Attack. Pressing on the Wii U will make Builder Mario take out a hammer. Use Yoshi amiibo from Super Smash Bros. series or Super Mario series Based on Yoshi's modern design as opposed to his sprite from Super Mario Bros. Deluxe. Upon touching a Mystery Mushroom, the sound effect that plays when climbing on Yoshi's back in Super Mario World can be heard. Yoshi's jumping sounds, the "Course Clear" fanfare and the "lose a life" tune are taken from Super Mario World 2: Yoshi's Island. Pressing causes Yoshi to turn into an egg. Shy Guy Super Mario Bros. 2 Clear 100 Mario Challenge on Easy setting or harder Shy Guy's original sprite from Super Mario Bros. 2, with added shading and a yellow belt buckle. The sound for picking up a mushroom in Super Mario Bros. 2 is heard upon transformation. It will turn into a Spear Guy upon pressing on the Wii U Control Pad. Use Wario amiibo from Super Smash Bros. series Wario's costume can also be used by tapping the first "M" in the Super Mario Maker logo on the title screen, which turns it into a "W". His sprite has a slight resemblance to the one from the WarioWare, Inc.: Mega Microgame$! microgame Super Wario Bros.. Sound effects from Wario Land: Super Mario Land 3 can be heard, including the "Course Clear" theme. Use Rosalina & Luma amiibo from Super Smash Bros. series The power-up sound effect from Super Mario Galaxy and Super Mario Galaxy 2 will play upon touching the Mystery Mushroom. The "course clear" and "lose a life" jingles are replaced with the "You Got a Star" and "Too Bad" fanfares from the latter game. An 8-bit Luma also appears as part of Rosalina's sprite. Rosalina is the most vocal out of the Mario characters; she exclaims "Here I go!" when transforming, yelps when she jumps, and shouts "Yay!" while holding . Sidestepper Mario Bros. Clear 100 Mario Challenge on Expert setting The Sidestepper's original sprite from Mario Bros.. It changes color from red to purple while dashing, and holding will make it angry. Shellcreeper Mario Bros. Clear 100 Mario Challenge on Expert setting The Shellcreeper's original sprite from Mario Bros.. It changes color from green to red while dashing, and holding will make it bare its teeth, like when it comes in contact with Mario or Luigi. Mario Mario Bros. Clear 100 Mario Challenge on Expert setting Mario's sprite from the NES version of the Mario Bros. arcade game. Upon touching the Mystery Mushroom, the "respawn" sound effect from the NES version will play. When clearing a stage, the "Game Over" theme from Mario Bros. will play. He makes the losing pose when the player presses . Use Dr. Mario amiibo from Super Smash Bros. series Mario's modernized Super Mario Bros. sprite (Costume Mario #2) further modified to look like Dr. Mario. Sound effects from the NES version of Dr. Mario will play. When the is pressed, Dr. Mario pulls out a Megavitamin. Kart Mario Super Mario Kart Clear 100 Mario Challenge on Easy setting Mario's modernized Super Mario Bros. sprite (Costume Mario #2), driving a Standard Kart from Mario Kart 8. Upon touching a Mystery Mushroom, the jingle that plays prior to the start of a race in Super Mario Kart can be heard. The course clear jingle is the race finishing jingle also from Super Mario Kart. A Super Glider also appears when jumping. The Super Star music changes to the version from Super Mario Kart when using this suit. Waluigi  Mario Tennis Clear 100 Mario Challenge on Easy setting An original sprite of Waluigi. When the player transforms, the sound of Waluigi laughing is heard, and when the is pressed, he pulls out his tennis racket. All the other noises are normal Super Mario Bros. sounds. Use Green Yarn Yoshi amiibo from Yoshi's Woolly World series When using a Green Yarn Yoshi amiibo, the sound effects are changed to ones from Yoshi's Woolly World, including Yoshi's modern voice and the "Course Clear" fanfare. Use Pink Yarn Yoshi amiibo from Yoshi's Woolly World series When using a Pink Yarn Yoshi amiibo, the sound effects are changed to ones from Yoshi's Woolly World, including Yoshi's modern voice and the "Course Clear" fanfare. Use Light Blue Yarn Yoshi amiibo from Yoshi's Woolly World series When using a Light Blue Yarn Yoshi amiibo, the sound effects are changed to ones from Yoshi's Woolly World, including Yoshi's modern voice and the "Course Clear" fanfare. Use Mega Yarn Yoshi amiibo from Yoshi's Woolly World series Near identical to Green Yarn Yoshi, except slightly bigger. Donkey Kong Jr. Donkey Kong Jr. Clear 100 Mario Challenge on Easy setting or harder Donkey Kong Jr.'s original sprite from Donkey Kong Jr.. Sound effects from the game can be heard as well. Use Turbo Charge Donkey Kong or Dark Turbo Charge Donkey Kong amiibo from Skylanders: SuperChargers series Based on the modern Donkey Kong rather than that of the original Donkey Kong arcade game. However, this costume uses sound effects from said arcade game for all of its sounds, including the victory fanfare when completing a level and the level start theme when collecting the Mystery Mushroom. Pressing causes Donkey Kong to give a thumbs up, and the sound for scoring by jumping over a barrel plays. Use Diddy Kong amiibo from Super Smash Bros. series Sound effects from Donkey Kong Country can be heard. Pressing will make him pull at and look at a banana. The victory fanfare is that of clearing a level in Donkey Kong Country, and the same goes for the "lose a life" jingle. Use Kirby amiibo from Super Smash Bros. series or Kirby series Kirby's original full-color sprite from Kirby's Adventure. Upon picking up a Mystery Mushroom, the power-up sound from that game plays. The "Course Clear" fanfare is replaced by the original version of the Kirby dance heard throughout the Kirby series. The jumping sound and "lose a life" tune also come from Kirby's Adventure. When riding a Goomba's Shoe, he adopts a pose similar to when he is riding a giant shoe in Kirby's Return to Dream Land. Use King Dedede amiibo from Super Smash Bros. series or Kirby series A modification of King Dedede's sprite from Kirby's Adventure, adjusted to match his current colors and Small Mario's height. Upon picking a Mystery Mushroom, the power-up-sound from Kirby's Adventure plays. Use Meta Knight amiibo from Super Smash Bros. series or Kirby series Meta Knight's original sprite from Kirby's Adventure, though without his sword. Upon picking a Mystery Mushroom, the power-up-sound from Kirby's Adventure plays. When Meta Knight runs at full speed, he runs similarly to how he does in Meta Knightmare from Kirby: Nightmare in Dream Land and Kirby Super Star Ultra. Pressing makes him take out his sword. Use Pit amiibo from Super Smash Bros. series A redesign of Pit's sprite from Kid Icarus shrunken down to fit Small Mario's height and recolored to resemble his appearance in Kid Icarus: Uprising. Sound effects are taken from the Famicom Disk System and 3D Classics Kid Icarus. Use Palutena amiibo from Super Smash Bros. series Based on Palutena's modern appearance rather than her original NES sprite. Pressing makes her assume the pose of her Super Smash Bros. artwork. Use Dark Pit amiibo from Super Smash Bros. series A recolour of the Pit sprite above (Costume Mario #34) in Dark Pit's colours. When falling in a pit, the Kid Icarus: Uprising rendition of the "lose a life" jingle from Kid Icarus will play. Use Mega Man amiibo from Super Smash Bros. series Based on Mega Man's original sprite from the NES Mega Man games, but scaled down to fit Small Mario's height. When grabbing the Mystery Mushroom, the sound for starting a stage in Mega Man 2 plays. The "course clear" and "lose a life" sounds are the ones from said game. Pressing causes him to take out his Mega Buster and the sound for firing a shot is heard. It's one of the few sprites outside of the Kirby series to have outlines. Use Samus amiibo from Super Smash Bros. series Based on Samus's modern Varia Suit design as opposed to her original NES appearance in Metroid, although there are some similarities to her original sprite. When collected, sound effects from the Famicom Disk System version of Metroid will play. Samus also turns into the Morph Ball when running at full speed. Use Zero Suit Samus amiibo from Super Smash Bros. series When collected, the "Item Found" jingle from Metroid: Zero Mission will play. Use R.O.B. - NES Edition or R.O.B. - Famicom Edition amiibo from Super Smash Bros. series Upon touching the Mystery Mushroom, the "Phase Begin" sound effect from Gyromite can be heard. The Japanese version of the game features the Famicom version of R.O.B. while other releases feature the NES version. Use Marth amiibo from Super Smash Bros. series Based on Marth's map sprite from Fire Emblem Fates rather than his original Famicom sprite. Sound effects from the original Fire Emblem: Shadow Dragon and the Blade of Light can be heard, including the level-up jingle. Use Ike amiibo from Super Smash Bros. series Based on Ike's map sprite from Fire Emblem Fates. Sound effects from Fire Emblem: Shadow Dragon and the Blade of Light are used, similar to Marth. Pressing will make him take out Ragnell and assume his Super Smash Bros. pose. Use Lucina amiibo from Super Smash Bros. series Based on Lucina's map sprite from Fire Emblem Awakening. Sound effects from Fire Emblem: Shadow Dragon and the Blade of Light are used, similar to Marth. Pressing will make her face the screen and put on her mask. Use Robin amiibo from Super Smash Bros. series Based on Robin's map sprite from Fire Emblem Awakening. Sound effects from Fire Emblem: Shadow Dragon and the Blade of Light are used, similar to Marth. Pressing will make him assume his Super Smash Bros. pose. Use Pikachu amiibo from Super Smash Bros. series Based on Pikachu's overworld sprite from the Nintendo DS Pokémon games. The default Super Mario Bros. sounds are used rather than new, Pokémon-themed sounds. Use Charizard amiibo from Super Smash Bros. series Based on Charizard's overworld sprite from the Nintendo DS Pokémon games. The default Super Mario Bros. sounds are used rather than new, Pokémon-themed sounds. Use Jigglypuff amiibo from Super Smash Bros. series Based on Jigglypuff's overworld sprite from the Nintendo DS Pokémon games. The default Super Mario Bros. sounds are used rather than new, Pokémon-themed sounds. Use Mewtwo amiibo from Super Smash Bros. series Based on Mewtwo's overworld sprite from the Nintendo DS Pokémon games. The default Super Mario Bros. sounds are used rather than new, Pokémon-themed sounds. Use Lucario amiibo from Super Smash Bros. series Based on Lucario's overworld sprite from the Nintendo DS Pokémon games. The default Super Mario Bros. sounds are used rather than new, Pokémon-themed sounds. Use Greninja amiibo from Super Smash Bros. series An original sprite. The default Super Mario Bros. sounds are used rather than new, Pokémon-themed sounds. Use Olimar amiibo from Super Smash Bros. series Olimar's voice from Pikmin 2 can be heard, and the "Course Clear" fanfare is replaced by the tune that plays after obtaining an important item in Pikmin 3. If the player presses , Olimar will blow on his whistle. Pikmin Pikmin Clear 100 Mario Challenge on Easy setting or harder Pikmin sound effects can be heard, the "lose a life" tune is replaced by the Pikmin's own death cries, and the "Course Clear" fanfare is replaced by the tune that plays after obtaining an important item in Pikmin 3. Pressing causes the red and blue Pikmin to mature into flowers. When underwater, all three of them are encased in a bubble. Use Link amiibo from Super Smash Bros. series Based on Link's sprite from, and uses sound effects from the Famicom Disk System version of the original The Legend of Zelda, including the fanfare for collecting a piece of the Triforce after clearing a stage. Upon touching the Mystery Mushroom, the original "Item Get" jingle will play. If the player presses , Link will hold up a Triforce piece. If Link dies, the death theme from the original Legend of Zelda plays. Use Zelda amiibo from Super Smash Bros. series Based on Zelda's appearance in The Legend of Zelda: Twilight Princess rather than her original NES sprite. Upon touching the Mystery Mushroom, the "Item Get" jingle from The Legend of Zelda: A Link to the Past will play. While holding , she'll transform into Sheik. When Zelda is defeated, the death tune from The Legend of Zelda: A Link to the Past plays. When clearing a stage, the tune that plays when Link meet Zelda for the first time from The Legend of Zelda: A Link to the Past plays. Use Ganondorf amiibo from Super Smash Bros. series Based on Ganondorf's appearance in The Legend of Zelda: Twilight Princess rather than Ganon's original NES sprite. Upon touching the Mystery Mushroom, his jingle from Ganon's Tower in The Legend of Zelda: A Link to the Past will play. When falling in a pit, the sound effect of a boss being defeated from that game will play. When clearing a stage, the first few notes of the encounter theme when Link comes face-to-face with Ganon in The Legend of Zelda: A Link to the Past plays. Use Sheik amiibo from Super Smash Bros. series Upon touching the Mystery Mushroom, the "Item Get" jingle from The Legend of Zelda: Ocarina of Time will play. While holding , she'll transform into Zelda and Zelda's Lullaby plays. The death tune is part of her theme song. The stage clear theme is the jingle that's heard when Link meets Zelda for the first time. Tingle The Legend of Zelda: Majora's Mask Clear 100 Mario Challenge on Normal setting Sounds from The Legend of Zelda: Majora's Mask can be heard: The victory jingle is the tune that plays when the player completes certain time-related events in said game, and the death jingle is one of the tunes that can play when failing certain such events. Use Toon Link amiibo from Super Smash Bros. series Based on Link's appearance from The Wind Waker (large eyes, blond hair, and a greener tunic) to distinguish itself from regular Link. Upon touching the Mystery Mushroom, the "Item Get" jingle from The Legend of Zelda: The Wind Waker will play. Toon Link takes out his Deku Leaf every time he jumps. The death tune is the tune that plays when Link gets caught by Moblins while trying to sneak inside the Forsaken Fortress in The Wind Waker. Use Shulk amiibo from Super Smash Bros. series Uses Shulk's voice clips from the Japanese version of Xenoblade Chronicles. Pressing will make him pull out the Monado and face the screen. The "Course Clear" fanfare is replaced by the tune that plays when discovering a Secret Area in Xenoblade Chronicles. Use Ness amiibo from Super Smash Bros. series When acquired, the PSI Healing sound effect from EarthBound plays. Clearing a stage plays the boss battle victory theme, also from EarthBound.When falling in a pit, the sound effect of Ness's party being defeated from that game will play. When is pressed, the jingle for learning a new technique will play. Use Lucas amiibo from Super Smash Bros. series The sound effect used when acquired is when an important item is gotten in Mother 3. Pressing plays the jingle when a new PSI ability is learned. The stage clear music that plays is when a boss is defeated. The party defeat jingle plays when the player falls into a pit. Use Inkling Squid amiibo from Splatoon series Based on the sprite from the Squid Jump minigame in Splatoon, and the "Course Clear" fanfare is replaced by the Mission complete fanfare from the single player mode of Splatoon. Pressing causes him to transform into a green Inkling Boy wielding a Roller. Use Inkling Boy amiibo from Splatoon series When crouching or swimming underwater, he turns into a blue Inkling Squid, and the "Course Clear" fanfare is replaced by the Mission complete fanfare from the single player mode of Splatoon. Use Inkling Girl amiibo from Splatoon series When crouching or swimming underwater, she turns into an orange Inkling Squid, and the "Course Clear" fanfare is replaced by the Mission complete fanfare from the single player mode of Splatoon. Pressing causes her to take out a Splat Charger and pose. Wii Balance Board Wii Fit Clear 100 Mario Challenge on Normal setting or harder The Balance Board mainly known for being used to play the Wii Fit games, although this particular one appears as the living character and companion to the player from the series, where the sounds of its footsteps and jumping are taken from. Holding has it lie flat on the ground while being used by Wii Fit Trainer to perform the Dancer pose. Use Wii Fit Trainer amiibo from Super Smash Bros. series Wii Fit Trainer's various poses include the Half-Moon pose while skidding/turning around, and the stretching position while crouching. She will also utter "Up!" or "Phew!" while jumping, as well as "Come on!" while doing a pose by pressing . When transforming, the sound made when logging into a profile in Wii Fit can be heard. The "lose a life" and "Course Clear" jingles are respectively replaced by the game over and victory themes from certain Balance Games. Use Chibi-Robo amiibo from Chibi-Robo! series Upon touching the Mystery Mushroom, the sound effect for putting on a suit in the original Chibi-Robo! plays. Pressing will make Chibi-Robo pick up his plug. The jumping and landing sound effects are taken directly from the original game. The sound for losing a life is replaced with the jingle that plays when Chibi-Robo runs out of energy. Upon clearing a course, the fanfare for ranking up in the original Chibi-Robo! is heard. Use Villager amiibo from Super Smash Bros. series Upon touching a Mystery Mushroom, the sound effect for producing an item such as a net from the Animal Crossing series can be heard. The "lose a life" jingle is replaced with the theme that plays after fainting from being bitten or stung by a tarantula or scorpion in Animal Crossing: New Leaf. Pressing will make him pull out a balloon. Use K.K. amiibo from Animal Crossing figure series or Animal Crossing card series Upon touching a Mystery Mushroom, K.K. will play a brief tune. Pressing will make him sit down on a chair and pull out his guitar, and the death tune is replaced by K.K. 's howl and a guitar twang. Use Mabel amiibo from Animal Crossing figure series Upon transforming, sound effects from the sewing machine in the Able Sisters shop from Animal Crossing can be heard. Use Kapp'n amiibo from Animal Crossing figure series or Animal Crossing card series Holding puts him in his rowboat from Animal Crossing. Use Isabelle (summer outfit) amiibo from Animal Crossing figure series or Animal Crossing card series Upon touching a Mystery Mushroom, the sound effect for producing an item such as a net from the Animal Crossing series can be heard. Various other sounds from Animal Crossing: New Leaf can also be heard, including the fanfare for paying off a mortgage after clearing a course. Use Isabelle (winter outfit) amiibo from Animal Crossing figure series or Animal Crossing card series Upon touching a Mystery Mushroom, the sound effect for producing an item such as a net from the Animal Crossing series can be heard. Various other sounds from Animal Crossing: New Leaf can also be heard, including the fanfare for paying off a mortgage after clearing a course. Use Digby amiibo from Animal Crossing figure series or Animal Crossing card series Pressing will make him put on a yellow raincoat. Use Captain Falcon amiibo from Super Smash Bros. series After grabbing the Mystery Mushroom, the sound effect that plays before starting a race in the original F-Zero can be heard. Pressing causes him to look at the screen and salute. The standard victory fanfare is replaced with that of the fanfare upon completing a cup from F-Zero, and his death sound is the sound that plays when the player's vehicle is destroyed in F-Zero, followed by the Ranked Out theme. Use Mr. Game & Watch amiibo from Super Smash Bros. series Pressing will make Mr. Game & Watch take out his bell. He also takes out a parachute from Parachute after jumping. Use Sonic amiibo from Super Smash Bros. series Based on Sonic's original appearance from the Sega Genesis Sonic the Hedgehog games. The Got Continue tune from the original Sonic the Hedgehog plays upon collecting the Mystery Mushroom. Pressing will cause Sonic to look up while making the sound for collecting a Ring, the course clear fanfare is taken straight from Sonic the Hedgehog 3, and the "lose a life" tune is the Game Over theme from that same game. Use Duck Hunt amiibo from Super Smash Bros. series Based on the sprites from the original Duck Hunt video game, though scaled down to match Small Mario's proportions. Upon picking a Mystery Mushroom, the perfect score jingle from the original game plays, and the original dog barking sound is heard when jumping. When falling into a pit, the dog's laughter is heard. Use Pac-Man amiibo from Super Smash Bros. series Based on Pac-Man's sprite from the Japanese version of Pac-Land, but without the hat that he wears in said game. Sound effects from the arcade Pac-Man can be heard (including the Intermission Theme for clearing a stage, and the original death jingle for losing a life), and Pac-Man also turns into his original sprite from said game when crouching, swimming, or running. Pressing causes Pac-Man to hold up a strawberry. Foreman Spike Wrecking Crew Clear 100 Mario Challenge on Normal setting or harder Sound effects from Wrecking Crew can be heard. Use Little Mac amiibo from Super Smash Bros. series Sound effects from the original Punch-Out!! can be heard, including the bell after touching the Mystery Mushroom. The "Course Clear" fanfare is also replaced with the victory theme from said game, and the "Lose a Life" fanfare is replaced with the theme when Little Mac loses a round. Use Fox amiibo from Super Smash Bros. series Upon touching the Mystery Mushroom, Fox's voice clip from the original Star Fox will play. Pressing will have General Pepper say "Good Luck" from the original Star Fox. When clearing a level, the "Mission Complete" theme from the original Star Fox plays. If Fox dies, a crashing sound can be heard and a loss of Arwing jingle can be heard; both from the original Star Fox. Use Falco amiibo from Super Smash Bros. series Upon touching the Mystery Mushroom, Falco's voice clip from the original Star Fox will play. Pressing will have General Pepper say "Good Luck" from the original Star Fox. When clearing a level, the "Mission Complete" theme from the original Star Fox plays. When dying, a crashing sound can be heard and a loss of Arwing jingle can be heard; both from the original Star Fox. Starwing (PAL) Clear 100 Mario Challenge on Easy setting or harder An unlockable costume. Upon touching the Mystery Mushroom, Slippy's voice clip from the original Star Fox will play. Pressing will have General Pepper say "Good Luck" from the original Star Fox. When clearing a level, the "Mission Complete" theme from the original Star Fox plays. When dying, a crashing sound can be heard and a loss of Arwing jingle can be heard; both from the original Star Fox. Starwing (PAL) Clear 100 Mario Challenge on Normal setting or harder An unlockable costume. Upon touching the Mystery Mushroom, Peppy's voice clip from the original Star Fox will play. Pressing will have General Pepper say "Good Luck" from the original Star Fox. When clearing a level, the "Mission Complete" theme from the original Star Fox plays. When dying, a crashing sound can be heard and a loss of Arwing jingle can be heard; both from the original Star Fox. Arwing Star Fox Zero Clear 100 Mario Challenge on Normal setting or harder Upon touching the Mystery Mushroom, the sound effect when collecting a supply ring in Star Fox Zero will play. Pressing will have it transform into an Arwing and use General Pepper's "Good Luck" voice clip from Star Fox 64. It also turns into an Arwing while running at high speeds, swimming, or crouching. The death tune is heard when losing a life in Star Fox Zero. When clearing a level, the "Mission Accomplished" theme from Star Fox Zero plays. Dr. Lobe Big Brain Academy Clear 100 Mario Challenge on Easy setting or harder When transforming, the bells at the beginning of the title theme of Big Brain Academy are heard. Ashley WarioWare: Touched! Clear 100 Mario Challenge on Easy setting or harder Ashley says "Hocus Pocus!" when the Mystery Mushroom is grabbed. When climbing or swimming Ashley rides on her broom. The death and stage completion jingles are replaced with those of the Ashley minigame of Game & Wario. Nintendo Letter Box (PAL) Clear 100 Mario Challenge on Normal setting or harder An 8-bit version of Nikki's redesign seen in Nikki's Travel Quiz and other recent appearances. When transforming and clearing a course, the sound from receiving new notes and the HOME Menu jingle from Swapnote play, respectively. Fighter Fly Mario Bros. Clear hard Gnat Attack for the first time When jumping, the Fighter Fly will make the same chirping sound as they did in the original Mario Bros. arcade game. If the player holds , it will turn into a Freezie. Totem Link The Legend of Zelda: Tri Force Heroes Clear the Tri Force Heroes Event Course An 8-bit rendition of the three Links of The Legend of Zelda: Tri Force Heroes (blue, red, and green) stacked up into a totem like in the game. Their transformation and stage clear sounds are 8-bit renditions of the series' main theme (unique from the other Link's) and the main theme of The Legend of Zelda: Tri Force Heroes. Pressing causes them to pose with various weapons. Crouching will get the Links into a pyramid formation in a similar vein to a Triforce. Arino KACHO GAMECENTER CX Clear one of the three Event Courses made by Arino A sprite rendition of Shinya Arino, host of GameCenter CX. All of Arino's sounds are clips of his own voice, with the course clear theme involving him singing along to the standard jingle. SUPER MARIO KUN CORO CORO COMIC Clear the SUPER MARIO KUN 25th Anniversary Event Course Based on Mario's design from the Super Mario-Kun manga, originally exclusive to Japan. This costume uses the same sound effects as regular Mario. This costume was released to celebrate the twenty-fifth anniversary of Super Mario-Kun. Cat Mario Super Mario 3D World Clear the Cat Mario's Course Event Course An 8-bit rendition of Cat Mario based on Mario's Super Mario Bros. sprite. The transformation sound is the Super Bell transformation from Super Mario 3D World, and the death tune and course clear themes are the corresponding ones from the same game. His running animation has him running on all four legs, and his jumping sound is Mario's jumping voice clip from Super Mario 3D World. Pressing causes Mario to pose with his paw in the air, making the "claw swipe" sound from Super Mario 3D World. Cat Peach Super Mario 3D World Clear the Cat Peach's Course Event Course An 8-bit rendition of Cat Peach, based on Mario's sprite from Super Mario Bros. but changed to resemble Peach. The transformation sound is the Super Bell transformation from Super Mario 3D World, and death tune and course clear themes from the same game. Cat Peach's jump sound is the same as from Super Mario 3D World as well. Pressing causes Peach to pose with her paws up, making the "claw swipe" sound from Super Mario 3D World. Necky Famitsu Clear the Yoshi Is Awesome Event Course A sprite rendition of Necky, the mascot of the Japanese gaming magazine Famitsu, wearing Mario's outfit. All of the sound effects are unchanged. Frog Mario Super Mario Bros. 3 Clear the NES REMIX Event Course Frog Mario's sprite from Super Mario Bros. 3. When the player presses Mario stands upright, resembling his normal sprite from Super Mario Bros. 3. Mario's jump sound, death tune, and course clear theme are all taken from Super Mario Bros. 3. Mario Trio Mario & Luigi: Paper Jam Clear the Mario & Luigi: Paper Jam Event Course A group consisting of Mario and Luigi, based on their Mario & Luigi appearances, and Paper Mario, largely based on his appearance in Mario & Luigi: Paper Jam. Upon touching the Mystery Mushroom, Mario says "Let's-a go!" and Luigi says "Okey-dokey!". When the player presses , Mario shouts "Wahoo!" and the sprite is replaced with one of Papercraft Mario with miniature Toads around it. The jumping sound combines Mario and Luigi's jump with Paper Mario's jump. Mario exclaims "Mama Mia!" upon defeat. The victory tune, titled "Getting Stronger", comes from that game. GLA Mercedes-Benz Clear the Mercedes-Benz Jump'n'Drive Event Course A sprite rendition of Mario driving a Mercedes-Benz GLA. The transformation sound is the same but with a car revving over it, and the jump is replaced with a similar sound. Pressing causes Mario to appear outside the car from an open door, the car honking and a door closing can be heard. Losing a life will play a jingle that is the similar to the original one but with a car honking and The "course clear" fanfare is a cover of the standard one. Felyne Monster Hunter Clear the Ma Rio Hills Event Course A sprite rendition of a Felyne from Monster Hunter. Pressing turns it into a cartoonish, outlined version of itself. Sky Pop Super Mario Land Clear the Southwest Air Adventure Event Course Mario in his plane from Super Mario Land, the Sky Pop, based on the original Super Mario sprite from the game. If the player presses , his feet appear and he looks towards the player as the coin sound effect from Super Mario Land plays. His death and clear jingles are also from that game. Arcade Bunny (PAL) Nintendo Badge Arcade Clear the Nintendo Badge Arcade Event Course The Arcade Bunny from Nintendo Badge Arcade, a pink rabbit in a suit. If the player presses , the bunny will take on a "strong man" stature and pose. Clearing the course will play the 3DS HOME Menu preview jingle, and losing a life will play the Practice Catcher results jingle. This costume was originally unused. Master Belch EarthBound Clear the Belch Base Event Course Based on Master Belch's overworld sprite from EarthBound. Pressing will make him belch and a stench to appear. Collecting the Mystery Mushroom plays the boss encounter jingle from EarthBound. Losing a life plays the EarthBound game over jingle and clearing the course plays the EarthBound boss clear jingle. Mr. Saturn EarthBound Clear the Welcome to Saturn Valley Event Course Based on the Mr. Saturn sprite from EarthBound. The transformation sound is the healing sound from EarthBound Pressing will make Mr. Saturn raise his eyebrows. Losing a life plays the game over jingle and completing the course plays the boss clear jingle. Captain Toad Captain Toad: Treasure Tracker Clear the Captain Toad: Treasure Tracker Event Course Unlike in Super Mario 3D World and Captain Toad: Treasure Tracker, Captain Toad is able to jump. The transformation sound is from Super Mario 3D World, but with Captain Toad's voice over it. Pressing will make Captain Toad pull out a star. Losing a life plays the losing a life jingle from Captain Toad: Treasure Tracker and clearing a course will play the course clear jingle from that game. Bike Excitebike Clear the NES REMIX (Excitebike) Event Course The sound effects are replaced by those from the 1984 NES title Excitebike. Pressing will make the Excitebiker do a wheelie on the spot. Birdo Super Mario Bros. 2 Clear the NES REMIX (Super Mario Bros. 2) Event Course Uses an original sprite rather than her sprite from Super Mario Bros. 2. Like Peach's costume, Birdo uses Super Mario Bros. 2 sound effects. Pressing makes Birdo wink. Yamamura Super Mario Maker Clear the Cooooo! (Feat. Yamamura) Event Course Uses original Super Mario Bros. sound effects, but with pigeon sounds added. Pressing will make Yamamura face the camera with a speech bubble next to his head. Daisy Super Mario Land Clear the Adventure in Sarasaland Event Course An original sprite based on Daisy's modern appearance. As with many other costumes, Princess Daisy uses voice clips from previous titles. Pressing will make Daisy grunt, facing the screen with her hands folded on her lap like her sprite's pose in Super Mario Land. Her course clear fanfare and death sound comes from Super Mario Land (the latter also having a voice clip over it). Professor E. Gadd Luigi's Mansion Clear the Paranormal Research Event Course An 8-bit stylized sprite of Professor E. Gadd. His jump sounds are taken from his voice clips. His course clear fanfare is the music that plays when Luigi defeats an area boss in Luigi's Mansion. Pressing causes him to face the screen, while Greenies appear around him. 122 Bulbasaur Pokémon Red Version/Blue Version/Yellow Version Clear the I Choose You! Event Course by picking the Bulbasaur path One of the three starters from the Kanto Region. Unlike the other Pokémon costumes already available in the game, the costume uses sound effects from Pokémon Red/Blue/Yellow: the level-up tune plays upon touching the Mystery Mushroom, and the level clear jingle is replaced by the Gym Leader victory tune. Pressing makes Bulbasaur look towards the player and emit its cry from the original games. 123 Charmander Pokémon Red Version/Blue Version/Yellow Version Clear the I Choose You! Event Course by picking the Charmander path One of the three starters from the Kanto Region. Pressing makes Charmander look towards the player and emit its original 8-bit cry. Unlike the other Pokémon costumes already available in the game, the costume uses sound effects from Pokémon Red/Blue/Yellow: the level-up tune plays upon touching the Mystery Mushroom, and the level clear jingle is replaced by the Gym Leader victory tune. 124 Squirtle Pokémon Red Version/Blue Version/Yellow Version Clear the I Choose You! Event Course by picking the Squirtle path One of the three starters from the Kanto Region. Pressing makes Squirtle look towards the player and emit its original 8-bit cry. Unlike the other Pokémon costumes already available in the game, the costume uses sound effects from Pokémon Red/Blue/Yellow: the level-up tune plays upon touching the Mystery Mushroom, and the level clear jingle is replaced by the Gym Leader victory tune. 125 Chitoge Kirisaki Nisekoi Clear either the Nisekoi: Tsugumi & Marika or Nisekoi: Chitoge & Kosaki Event Courses The female protagonist of the manga series Nisekoi. Pressing makes Chitoge do a winking pose with a peace sign. Her level clear jingle is the default one from Super Mario Bros, while her other sound effects are replaced with twinkles. 126 65px Barbara the Bat Jam with the Band Clear the Barbara in Tomatoland Event Course A sprite version of Barbara the Bat. 127 Statue Mario Super Mario Bros. 3 Clear the Secrets of Statue Mario Event Course Statue Mario's sprite from Super Mario Bros. 3. The regular Super Mario Bros. Small Mario can be seen behind the statue, which carries the statue around while moving. Sounds are used from Super Mario Bros. 3. Dashing will have Mario carry the statue. Pressing will have Mario peek out. Use the Wolf Link amiibo from The Legend of Zelda series A sprite rendition of Wolf Link and Midna from The Legend of Zelda: Twilight Princess. It uses the Wolf Link and Midna audio and the theme for the death and goal from The Legend of Zelda: Twilight Princess. Tetra The Legend of Zelda: The Wind Waker Clear 100 Mario Challenge on Normal setting or harder A sprite rendition of Tetra from The Legend of Zelda: The Wind Waker. Pressing makes her transform into toon Zelda. Course clear and death sounds are similar to Toon Link's. Ayumi Tachibana Famicom Detective Club Part II Clear 100 Mario Challenge on Expert setting or harder A sprite rendition of Ayumi from the Famicom Detective Club series. Baby Mario Super Mario World 2: Yoshi's Island Clear 100 Mario Challenge on Expert setting or harder Uses an edited version of the sprite based off Baby Mario's appearance in Super Mario World 2: Yoshi's Island. When the player presses , he cries. ↑ 2.00 2.01 2.02 2.03 2.04 2.05 2.06 2.07 2.08 2.09 2.10 2.11 2.12 MidwestProfessor. (August 18, 2015). Super Mario Maker #15 - Amiibo Party! Squats, dashes, intros. YouTube. Retrieved August 19, 2015. ↑ Nintendo World Report TV. (June 18, 2015). Super Mario Maker: Pink Parasol Mystery Mushroom (Direct Feed Gameplay). YouTube. Retrieved July 8, 2015. ↑ 5.0 5.1 5.2 5.3 5.4 5.5 Nintendo. (June 16, 2015). Nintendo Digital Event @ E3 2015. YouTube. Retrieved July 8, 2015. ↑ 8.0 8.1 Nintendo. (June 31, 2015). IGN Plays Live Presents: Super Mario Maker. YouTube. Retrieved July 31, 2015. ↑ , YouTube. Retrieved September 11, 2015. ↑ GameXplain. (June 18, 2015). Super Mario Maker - Yoshi on a Super Mario Bros. Airship (Direct Audio - E3 2015). YouTube. Retrieved July 8, 2015. ↑ GameXplain. (August 18, 2015). Super Mario Maker - 11 Title Screen Secrets (Easter Eggs). YouTube. Retrieved August 18, 2015. ↑ Pixelkabinett . (August 21, 2015). Super Mario Maker Preview - Metroid U in the editor. YouTube. Retrieved August 21, 2015. ↑ 18.0 18.1 18.2 18.3 18.4 18.5 MidwestProfessor. (August 18, 2015). Super Mario Maker #11 - 8 levels, a few Pokemon, and Ashley. YouTube. Retrieved August 18, 2015. ↑ SUPER MARIO MAKER SUPPORTS 99 AMIIBO ‘MARIO’ COSTUMES. Vooks. Retrieved July 29, 2015. ↑ Miiverse post in the Mario Maker media community, Miiverse. (Retrieved August 18. 2015). ↑ Super Mario Maker gives players a new costume for completing Gnat Attack’s hard mode. Nintendo Everything. Retrieved 4 November 2015. ↑ nintendaan. (15 October 2015). Super Mario-kun costume coming to Super Mario Maker. Gonintendo. Retrieved 15 October 2015. ↑ 38.0 38.1 GameXplain (November 10, 2015). Cat Mario & Cat Peach Costume Trailers in Super Mario Maker. YouTube. Retrieved November 10, 2015. ↑ Nintendo of Europe (December 1, 2015). From 03/12 get a Paper Mario Costume by beating the #SuperMarioMaker Event Course made by the Paper Jam Bros. team. Twitter. Retrieved December 1, 2015. ↑ Nintendo Force (February 23, 2016). "Tried tapping the new Wolf Link & Midna amiibo into Super Mario Maker. Sure enough, it's Costume #132!". Twitter. Retrieved February 23, 2016. ↑ GameXplain copy of the Nintendo Direct Trailer. This page was last edited on March 10, 2016, at 22:39.